Save money by building your own AR-45 rifle from the ground up exactly the way you want it configured and shoot for less! ANSWER: Yes, before firing your new pistol caliber lower we suggest you adjust your ejector. Loosen the two screws holding the ejector in to where it becomes a semi-tight friction fit. Ensure the ejector is seated all the way to the rear and all the way down in the pocket. Close your upper onto the lower with the bolt all the way forward. SLOWLY cycle the bolt in and out about 1/4 of the way back a few times then let the bolt close all the way and tighten the ejector screws. They are cupped to get a good grab on the SS ejector, so only hand tight or you risk the chance of bending the ejector over. Any slight rubbing at this point will wear in the ejector after a few magazines are cycled through the gun. If you see excessive rubbing you can also file down the top corner on the left side of the ejector (shooters left). At this point you should remove one screw at a time without disturbing the ejector location and add loctite to the screws and tighten them back down. This will ensure the screws will not back out over time. ANSWER: The lower was designed to fit and drop free factory Glock large frame pistol magazines. Although it accepts and shoots other aftermarket magazines some slight modification may be needed to get them to drop free from this lower because of the varying width measurement we have seen when checking these magazines to Glock factory specifications. ANSWER: YES — After watching several companies try and fail to incorporate a RELIABLE last round bolt hold open (LRBHO) system into their lower receivers we decided to take a different approach and will be incorporating our LRBHO technology (PATENT PENDING) in our matching upper receivers. After rigorous testing and hundreds of hours of research and development we feel that this is the best option for LRBHO on a Glock magazine AR style firearm. 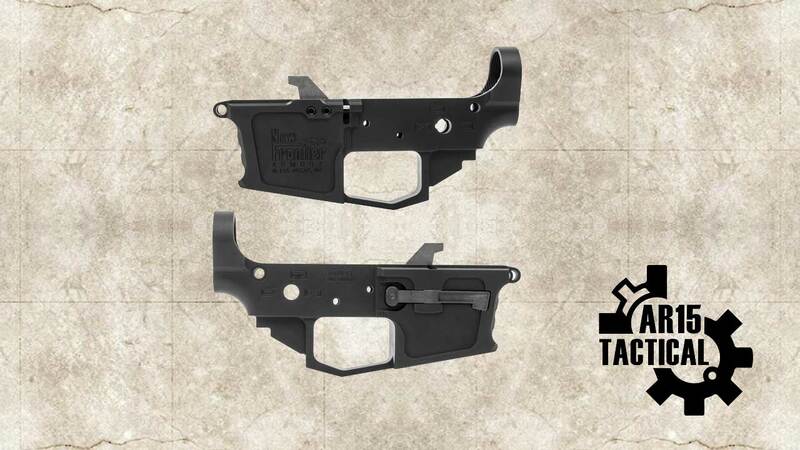 Our upper will be compatible with other manufacturers lower receiver that either don’t have a LRBHO or you can scrap the non-working LRBHO out of your existing AR-45 Glock Mag lower and solve the issue of not having a 100% functioning LRBHO. For more information on our matching Pistol Caliber Upper, please CLICK HERE. QUESTION: What bolt carrier group will work with a Glock magazine fed AR-45? ANSWER: You will need an AR-45 Bolt Carrier Group that has relief cuts to clear the Glock style magazines. Our Standard .45 BCG can be found here. ANSWER: Although we sell a specific LPK with just the parts needed to build the C-45 lower receiver HERE, any standard AR-15 LPK will work. You will not need the magazine catch assembly, bolt catch roll pin, or trigger guard that are normally included with standard LPKs. QUESTION: Do I need to use a special buffer when I build my AR-45? ANSWER: It is advised that you use an 8 oz or heavier buffer. Lighter buffers aren’t safe to use in a blowback system with larger calibers such as the .45ACP and 10mm, and they may not feed some types of ammunition reliably without the added weight.